Last Saturday evening, a few of us get together to have an early Chinese New Year dinner over at my place. Although this was not the first time I prepared food for such as big group of friends other than my family, I am still very nervous and a bit stress up with planning the dishes as well as preparations. 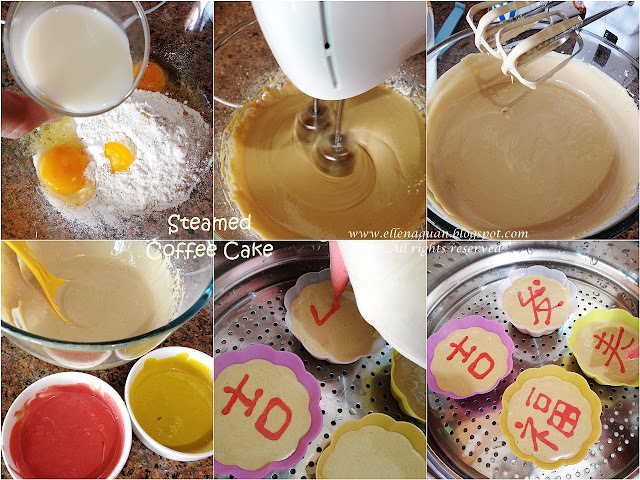 This is my first time attempting Chinese New Year steamed cake as compared to my usual new cookies and dishes. But since I wanted sometime fusion rather than the traditional Steamed Prosperity Cakes (Fa Gao - 发糕), I decided to use a sponge cake recipe and give it a twit by adding instant coffee powder and brown sugar to achieve a similar colour like Fa Gao. On top of that, I also decorate it with some auspicious New Year wordings like 发财(Fa Cai), 福(Fu), 大吉(Da Ji) and etc by pipping outlines of the Chinese characters on it. With some Gold Kili Instant Double Shot White Coffee Powder that I found in my pantry, I decide to add it into my sponge cake mixture to create our all-time favourite steamed coffee cake. The texture of these steamed cakes are very soft and fine which resemble those Japanese Steamed Cakes which are available in four leaves or some Japanese bakery. 1. Add all the ingredients into the mixing bowl and whisk using an electric beater on medium speed (speed 3) for about 6 minutes till mixture form ribbon trace when beater is lifted up from the batter. 2. Set aside 2 Tablespoons of the batter and coloured it with some red food gel till well mixed, spoon it into a piping bag and set aside. 3. Next spoon the coffee batter into another piping bag and fill each cupcake liner till 3/4 full. 4. Cut a small opening at the end of the red batter piping bag, make sure the opening is not too big or else the wording will be too thick. 5. Pipe some auspicious Chinese words on the prepared plain batter then arrange the cups in a steamer and steamed on medium high heat for 12 – 14 minutes depending on the size and heat. Overall these cake are light in texture which filled with distinctive coffee flavour that make it a great snacks for the visiting guests during Chinese New Year. Imagine having this auspicious cake and wishing each other a prosperous new year with some "Lotus Seeds, Longan And Persimmon Sweet Soup". Lastly I am submitting this post to Chinese New Year Delights 2013 hosted by Sonia aka Nasi Lemak Lover. Not long ago, I come across a new seasoning from Japan known as Shiokoji (塩麹 - salted malt rice) which was given to me by another food blogger friend. For short, Shiokoji is a traditional condiment made from fermented malted rice, salt and water. And if you happen to find Shiokoji in Singapore or during your trip to Japan, do grab hold of some and you would be amazed on the dishes it could produce. Although the above grilled salmon requires only Shiokoji as the main seasoning but the end product surprisingly brings out the flavour of the salmon with hint of fragrance and savory taste. This happens because Shio-koji imparts a rich savory flavor that makes any dish delicious and it acts as a great seasoning on fish or meat too. 1. Marinate salmon fillet with Shiokoji for about 5 - 10 minutes. 2. Drizzle some olive oil on griddle pan, grill salmon fillet with skin side down for about 4 minutes (depending on the thickness) on each side over medium heat till slightly golden brown in colour. ~ As Shiokoji tends to burn easily, remember to lower the heat during cooking to prevent it from getting burnt. Sometime we love simple meal like the above and it would be great too if you just want to narrow down the menu to only Onigiri (rice ball) plus one main dish. But if you have time, you could always add on another simple side like hard-boiled egg or boiled Edamame. 1. Marinate mackerel with shiokoji for at least 5 minutes or not more than 30 minutes. 2. Preheat a frying pan with 1 tablespoon of oil, pan-fry the marinated mackerel for 2 minutes on each side or till slightly golden brown in colour. Remove and set aside. 3. 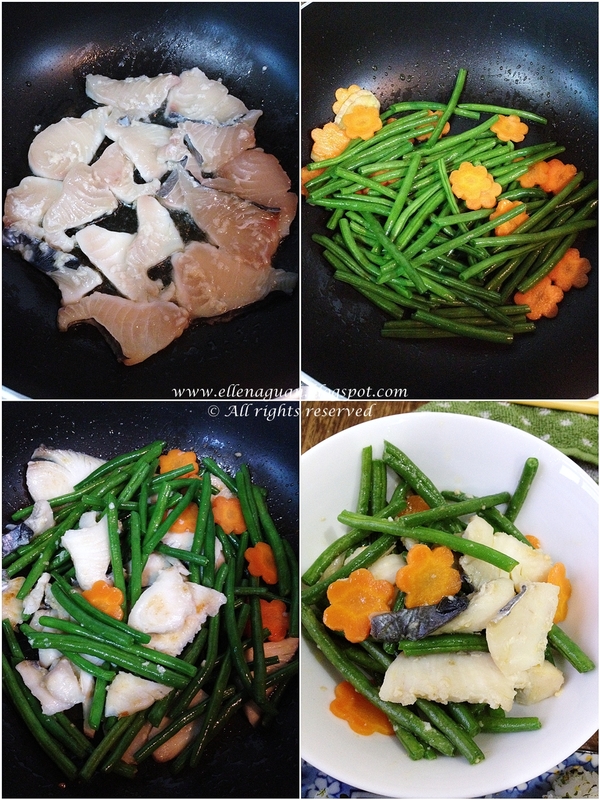 Next add in another teaspoon of oil, stir-fry the carrot and french bean till french bean change to darker green colour, toss in mackerel fillet and give it a quick stir till well-combined. 4. Remove on serving plate and serve with steamed white rice. Other than the two fish dishes above, I also used Shiokoji to marinate chicken fillet which taste great as a simple dish on itself. And just for your information, the portion of Shiokoji to any meat ingredient weight is 1:10 which means for each 100g of meat, use 10g(1.5 teaspoons) of Shiokoji. But then it is still up to individual to adjust the amount of Shiokoji used according to their taste preference. Chawanmushi is one of our favourite egg dish and nothing would go wrong when you follow Nami's (Just One Cook Book) quick and easy Japanese recipes on her site. 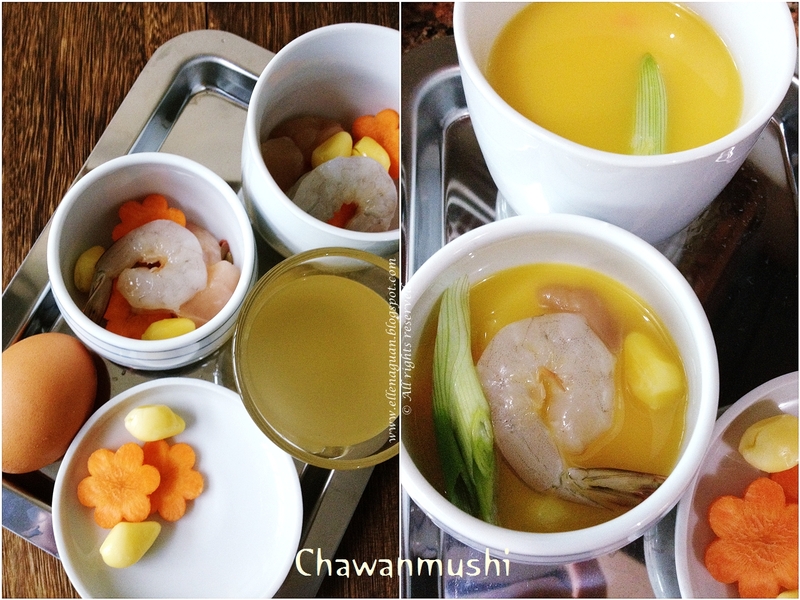 Here I followed one of her savory Chawanmushi recipe which includes step-by-step illustrations that helps to make this delicious Japanese Steamed Egg Custard. So do check up Nami's website for more recipe ideas too! Chinese New Year (CNY) is less than a month away and I am sure everyone is busying with spring cleaning, planning New Year reunion dinner, gatherings as well as what to cook for the visiting guests and etc. 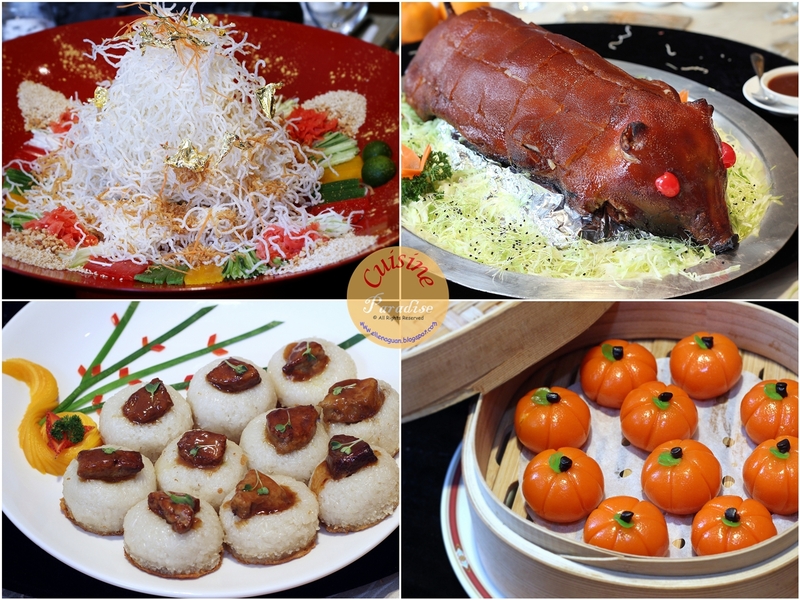 Over the years, I have some collection of Chinese New Year recipes on dishes, desserts and bakes which you might be interested to take a look and hopefully it would help to spark up some inspirations for your CNY menu. To shorten the cooking process of the usual CNY dishes like Braised Mushroom With Sea Cucumber, Fish Maw Soup, Braised Soy Duck, Chicken Curry and etc. Here I have a quick and healthy Grilled Salmon with Orange Marmalade that served with steamed vegetables which I think it would be great idea to add into your New Year Menu. 1. Check and remove all the bone from the salmon fillet using a tweezer. 2. Combine all marinade and marinate the salmon for 5 minutes. 3. Lightly grease a griddle pan, grill the salmon fillet with skin side down first for about 4 - 5 minutes each side over medium heat. 4. To make the marmalade sauce: remove the salmon from the pan, add in ¼ Cup Frezfruta Orange Marmalade to the marinade mixture and simmer till mixture comes to boil. Remove from heat. 5. To serve, top salmon fillets with Orange Marmalade Sauce and steamed vegetables as sides. I choose salmon because I love the taste and texture when combined with the marinade especially the orange marmalade which helps to boost up it taste. But just remember not to over cooked the salmon or else the meat would be too dry. I love Tau Sar Piah especially those Traditional Salty Tau Sar Piah which is infused with fragrance fried shallot aroma that binds together wtih blend mung bean paste. Since my in-laws are staying in the East side, my mother-in-law used to buy my favourite Tau Sar Piah from Thy Moh Chan Cake House which was previously located at Geylang Lorong 27 until it closed for retirement during September 2011. But about a year after it closed for business, this well-known traditional tau sar piah was bought over by BreadTalk ground and it was relaunched again in December 2012 with it's main outlet at Chinatown Point and another retail at Parkway Parade's Food Republic. While staying true to original recipes the relaunched Thye Moh Chan also brings in new flavours which is tastefully packaged in contemporary style too. And on our first visit to the new outlet, I decided to grab a box of 8 pieces (S$10.80) with mixture of traditional and new flavour to satisfy my craving on missing their Tau Sar Piah for a year. On top of the all time classic flavour, they also add in new innovative fillings such as Cranberry, Spicy Pork Floss, Salted Egg Yolk, Assorted Nuts and etc. I have tried the Cranberry Tau Sar Piah but for me it don't think the taste blend well (too sweet) with the traditional fillings but I would still like to try their Yuan Yang which is a pairing of savoury bean paste with spicy pork floss and salted egg. For me to find and able to eat my favourite Tau Sar Piah again is definitely something good to share but on the other hand because of the take over and relaunched the price of the pastries also increase as compared to those sold in the old outlet. With Chinese Luna New Year getting closer, I believe everyone is busying with a list of "must buy" ingredients, goodies, tidbits and etc in order to prepare and feed the guests who are coming over for new year house visiting. This year, thanks to Tai Sun and 20twentypr for the early New Year goodies which definitely come in handy for us due to it's wide selections of snacks for our guests. The snacks are packed neatly inside this traditional bamboo basket which resemble those olden day (60s) food carrier or sort of like our modern picnic basket. And this unique basket is sure a keeper for me as my kid already hint for a picnic date with it soon on one of the weekend. Inside the bamboo basket, there are two tubs of Chinese New Year cookies from NOYA (under Tai Sun (Lim Kee) Food Industries too) such as Macadamia Delight and Rolled Pineapple Tarts which you can read more about them at my review post on NOYA products HERE. Apart from the NOYA Chinese New Year cookies, there are also Roasted Cashew Nuts and Hei Bee Hiam Spring Rolls which are two of the popular snacks among guests. On top of that, there are also some varieties of broad beans (satay and wasabi flavour) which are a great source of dietary fibre that helps to promote a healthy digestive system. For your information:- 100g of broad beans give you more fibre than eating 4 apples or 10 carrots. Other than broad beans, Tai Sun also have other nuts products like roasted peanuts, cashew, almond and etc for your to select too. But if you are looking for something more towards nature flavour, perhaps Nature's Wonders which has a premium range of nuts and dried fruits might suits your preference. Their products comes with good source of dietary fibre as well as rich in protein. Furthermore Nature's Wonders products are naturally trans fat free with no added salt which makes it a healthy and high energy snack that helps you on the go! So for this coming Chinese New Year if you are looking for some nuts or snacks to stock up for your guests perhaps you could take look at Tai Sun, NOYA or Nature's Wonders range in leading supermarkets too. Chinese New Year is about less than a month from now and most of the hotels and restaurants are all coming up with lists of attractive Luna New Year Lo Hei menu catering for everyone preference and budget. And just last Saturday, I have attended a Media Lunch at Park Palace where I would share some of their highlight New Year dishes which you might be interested with. This Spring Festival, Park Palace brings you the the art of tossing Yu Sheng where you would get a shimmering gold boost with its Golden Shunde Yu Sheng (S$88.00++). As what shown above, their yu sheng was quite different from the usual one we had as they replaced shredded lettuces with crispy fried vermicelli. On top of it, this dish was also given the finishing touch with gold dust and gold flakes. The Golden Shunde Yu Sheng also comes with two plates of Fresh Yellowtail rather than salmon slices. Tossing our way "High Up (撈起)" together with a list of auspicious wishes hoping that each and everyone of it will come true soon. Other than crispy fried vermicelli, Golden Shunde Yu Sheng also consists slices of ginger, spring onion, crunchy capsicums and finely grounded peanuts which tossed in their special combination of fragrant peanut oil and premium soya sauce. I am sure most of you love Suckling Pig especially it's thin and crispy outer skin which goes well with the steamed pancake and savory sauce. At Park Palace, the piglet used for the Imperial Suckling Pig (S$238.00++) weighs about 5kg and it was air-dried and roasted in the restaurant itself. So in order to avoid disappointment, guests are advisable to make reserve for the order at least one day in advance. Some of us were amazed by the thinly sliced cracking skin which we could hardly see any fats or meat on it. The skin was also flavoursome even without the accompany serving sauce and it leaves you craving for more servings too. Other than the crackling skins, the left over portion (the meat) was then made into another dish by oven-baked it with lemongrass and other seasonings. Each piece of the meat was infused with lemongrass fragrance and the taste was also not too overpowering. Even though I am a fish lover, I don't really fancy this Golden Happiness Crispy Garoupa perhaps it was a bit too dry towards my liking even though it was served together with some special sweet and sour sauce drizzling on it. Prosperity Flambé Pen Cai was the highlight of the day where it boasts 18 luxuriant ingredients and with a twist it was infused with Cognac, and flambéed to bring out the rich flavours and tastes of its ingredients with a tang of alcohol. As you could see from the above, this delicacy is brimming with 18 luxuriant ingredients including Sliced Abalone (鲍鱼片), Sea Cucumber (海参), Whole Conpoy (柱脯), Prawn Balls (明虾球), Scallops (带子), Roasted Duck (烧鸭), Roasted Pork Belly (火腩), Duck Web (鸭掌), Soya Chicken (油鸡), Sliced Sea Perch Fillet (鲈鱼片), Fatt Choy (发菜), Black Mushroom (北菇), Lotus Root (莲藕), Broccoli (西兰花), Radish (白萝卜), Beancurd Skin (豆筋), Gingko Nut (银杏), Black Fungus (云耳) and Tien Shin Cabbage (津白) with quality stock in a casserole pot. The pot we had (refer to above) was actually for 6 persons serving and yet the 10 of us at the table can't even finished it! So you roughly could gauged there were indeed a lot of treasures in the pot and you might be surprised on what you could scoop out from it too! As usual the second last dish is always either noodle or rice, and on that day we had something fusion which served in individual portion that was known as Auspicious Glutinous Rice with Foie Gras and Preserved Meat. Each glutinous rice ball was wrapped with diced preserved meat fillings, pan-fried till crispy at the base and served with a generous slice of Foie Gras on it. The juice and fragrance from the preserved meat had definitely enhance the taste of the glutinous rice but most of us find portion of the rice was a bit too much for an individual serving. Dessert was served in a bamboo steamer and when the lid was opened, everyone was in excitement because of the bright orangey pumpkin alike dumplings. These Steamed Mini Pumpkin Dumplings were made using the natural colour from the pumpkin puree and wrapped with generous amount of green bean paste which is lightly fragrance with tangerine peel or something similar. Lastly I would like to thank Jean (Assistant Marketing Communication Manager of Grand Park City Hall) and Park Hotel Group for the warm invitation and hospitality at Park Palace. If you are planning for family, office gathering or business lunch this coming Chinese New Year perhaps you would like to take note of their Early Bird Special: Book now and dine in from 21 January to 07 February 2013 and enjoy 20% off Lunar New Year Set Menus and a la carte at Park Palace.